There is no dye in the colors brought out in titanium, niobium, or tantalum. When 2 parallel continuous waves of the same frequency collide, the resulting wave will be the same frequency, and somewhere between the sum of the sizes of the two incident (starting) waves, and completely flat. If the crest of one lines up with the trough of the other, they cancel out. If the peak lines up with the peak, then they reinforce. Light, which is made up of energy packets called photons, can also be modeled as light waves. A beam of light can be accurately visualized as waves in the (proven non-existent) interstellar ether, like water waves propagate on water. Visible light has wavelengths from 350nm (blue) to 700nm (red). Between these falls the full rainbow spectrum of visible light. nm = nano-meters: 25,400,000 nm = 1", 1,000 nm = 1 micron, 1/10nm = 1 Å is the diameter of a hydrogen atom. 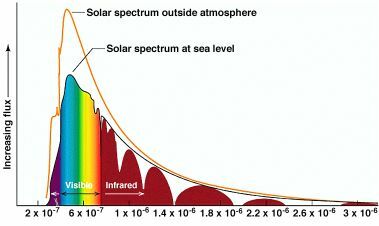 White light is made up of all colors together in particular proportions; similar to a black-body radiation skewed bell curve peaking at blue-green. The solar spectral distribution is what we call white. When there is a transparent dielectric material (dielectric = insulator, like glass, water, quartz, titania) in contact with air, light will reflect off of the boundary with an efficiency proportional to the sine of the incident angle and to the dielectric constant (density, sort of) of the material. The farther the angle is from straight on, the better the surface reflection. Light reflects from metals. Duh, you say? Okay, so we know that a clear layer on metal is like a mirror (or vice-versa). There are really 2 reflections. So, if a light wave of a single frequency hits the mirror, it reflects once from the clear part, and once from the metal. When they come out, they run into each other. What happens? Right. They interfere with each other. If the dielectric is thick enough, like several wavelengths of light or more, nothing noticeable happens. All the interesting effects are statistically cancelled out. However, if the distance the light has to travel through the dielectric	to bounce off of the metal and back up to where it hits the first reflection is between ½ and 2 or so times the wavelength, then the interference gets interesting. If, for example, the total length (twice the thickness) is about half the length of the wavelength of red light, then it is also about the full wavelength of blue light. So, blue light will be reinforced, and red will be cancelled! Since white is made up of all colors, the blue end of the rainbow comes back out, and the red gets lost. The shorter blue wavelength reflects of the surface, and off the metal. The interior wave travels a full wavelength farther than the first reflection, so they reinforce. The longer red wave travels the same distance, but that's only ½ of its wavelength, so it cancels out. When all the colors which are in white bounce off this double layer, what you see is blue. Light travels slower in a dielectric. The speed of light reduction factor is also known as the dielectric constant. 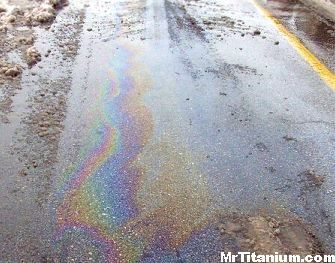 Titania (TiO2) has a fairly high constant, so the wavelength of light in the titanium surface is noticeably shorter for a given color than the vacuum-based 350-700nm. This doesn't change the way it behaves. On the microscopic scale of wavelengths of light, the metal surface is not really flat. The oxide surface is only somewhat flatter, but not exactly parallel . This uneven-ness actually enhances the colors by statistical integration of the different colors coming from microscopically different areas and microscopically different angles. In fact, the brightest colors are realized by etching the surface to a veritable mountain range of micro-crystalline topography. Heat. Titanium eagerly grabs oxygen from the air, but the oxide layer blocks slow moving oxygen from the surface. So, torch the surface gently to give the atoms the boost they need to charge through the dielectric barrier to bond together and build a thicker layer. It's a bit hard to control, but you can easily get the first-order colors (bronze, blues, maybe yellow). Higher-temperature / longer-time colors are much harder to get and control with heat. put some metal (stainless, aluminum, titanium) in at one end as the negative electrode for the hydrogen to bubble off of, and connect the positive lead to your titanium piece. The higher the voltage, the harder the oxygen ions slam into the dielectric, so the thicker the dielectric grows before it can block those ions. Conveniently, the barrier potential of useful colors is between about 25 and 130 volts. To get the higher voltage colors (magenta/pink and greens) the surface must be etched. Check out my anodizing page for more detailed instructions on coloring titanium with an anodizer. Read my Oxide calculations page for the math to figure out how thick the oxide is and how much current you need. See my anodizer page for instructions on building or getting an anodizer (the power supply).